In April 2015, Head of Historic Carving Tim Crawley and Vice Principal Magnus von Wistinghausen visited the Berliner Schloss Projekt and the workshop of Andreas Artur Hoferick, one of the Master Carvers working on the reconstruction of the exterior façade of the gigantic Berlin Palace, or Berliner Schloss. The visit opened the doors for a new collaboration, with one of our graduates joining the workshop for a three months’ work experience in Summer 2015. The Berlin Palace will be rebuilt as the home of the Humboldt Forum, an art, culture, science and learning centre dedicated to the dialogue between world cultures, and a forum for debate and analysis of issues of global significance. A key element of the Palace’s reconstruction is the detailed reproduction of its richly decorated Baroque facades, which are to be covered in decorative sculptures and architectural carvings. 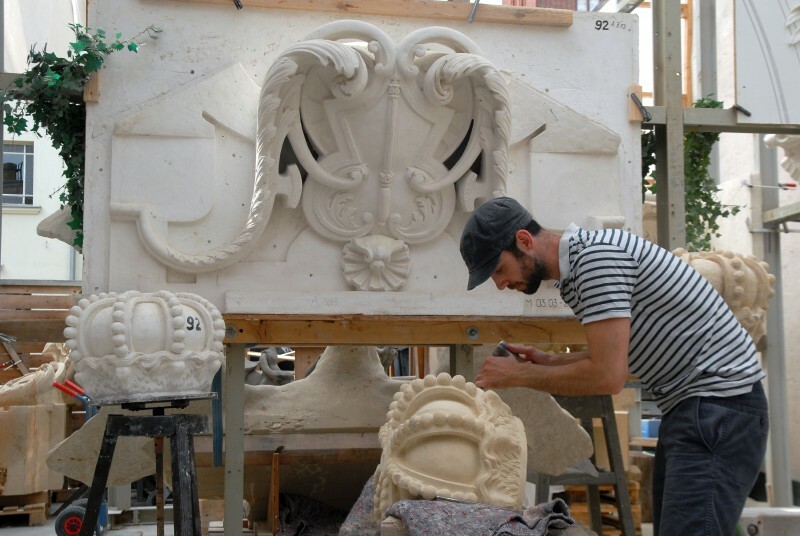 Michael Cooper graduated from the Diploma in Architectural Stone Carving in June 2014, and was selected for the work experience, joining the Hoferick workshop in July.